Mithraeum of the Snakes – Mithraeum. Our Common Sun. The Mithraeum of the Snakes measures 11.97 x 5.25. The main entrance is in the north wall, slightly off-centre, 1.70 wide. The wall on either side was created for the mithraeum. An opening in the south wall was blocked. The podia are made of rubble masonry. The western podium was reached along a brick tread. In the centre of the vertical part of the podium are niches. Set against the back wall is a structure consisting of two treads, between two walls. The upper part of the structure has not been preserved. In front is a small masonry altar. Nothing remains of the floor, that may have been of wood. In the back part of the shrine, on the east and south wall, paintings have been preserved. On the east wall is a painting of a female snake, without comb or beard (a Genius Loci), and of a Genius wearing a tunica and a toga, capite velato, holding a cornucopiae (presumably the Genius of the paterfamilias). On the south wall is a male snake, with comb (another Genius Loci). Behind the snakes is shrubbery, above the scene are garlands. The paintings are older than the mithraeum (early-Antonine? Gallienus?) and were respected in the shrine, possibly because the snake occurs in the cult of Mithras as a symbol of the earth. During the excavation a small, square, travertine altar was found. 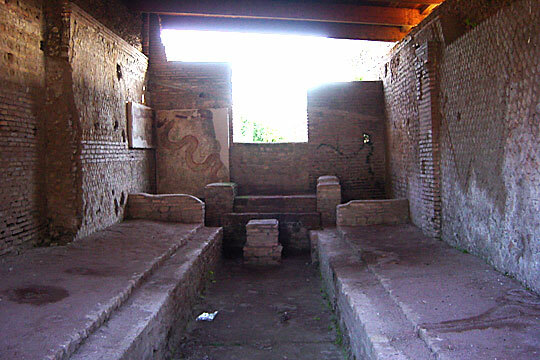 The mithraeum may have been built c. 250 AD or somewhat later. Dating: 1st half of the II century A.D.